BEX is mostly known for producing some very lightweight high quality sunglasses designed for those pursuing an active lifestyle. I even had the opportunity to write a review on them in the past and they truly are some great sunglasses. As I continued conversation with BEX since then, they had hinted that they would be coming out with their own camouflage pattern. My first thought was, how would a company that designs sunglasses create a camouflage for hunting? Well they did and it was impressive. 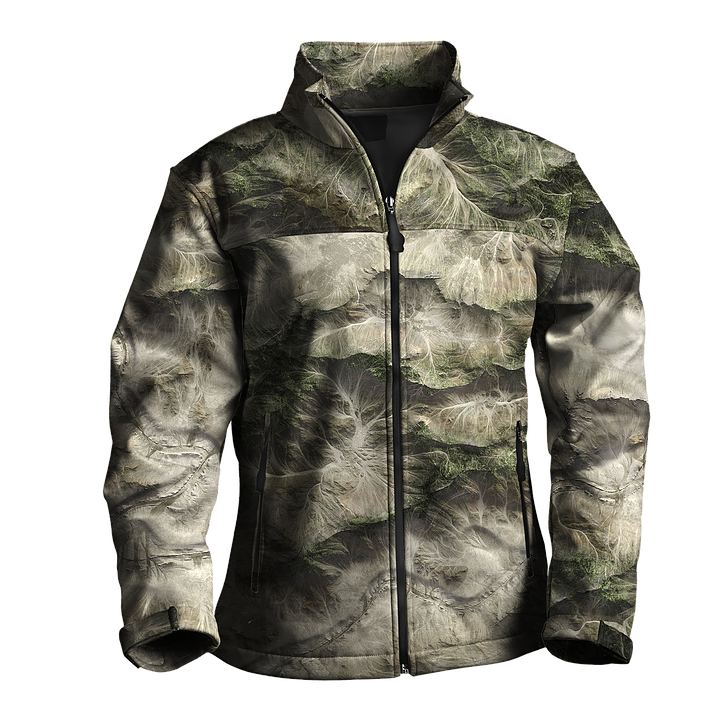 The BEX camouflage fit is very true to size. I typically wear a size large in my jackets and when I tried this one on the arms were not too long and the length was perfect down around the waist. It was not tight and did not restrict my movement and was not bulky either. I was very comfortable wearing the jacket and felt like I could draw my bow very easily or pull up to shoot with my rifle. The pants were similar. I was very happy with the way that they fit without any restrictions or being too long or too short. There was plenty of room to add some layers underneath without them feeling like they were bulky or oversized. The polar fleece lining was perfect for keeping me warm and added some cushion while stalking on the antelope. The only hiccup I had is when I first unboxed the pants, I noticed that the hole for the button was sewn over. I just used a razor blade to open it up without ruining the stitching. This was an easy fix and I know this was just a unique instance. I didn't let that hinder my experience with the camo. Both the jacket and the pants are made from 100% polyester. I have never owned polyester hunting clothing so I did notice the sound of the clothing as I wore it. It did make a "swishing" sound as I walked. Now I have talked to several people who own other polyester hunting clothing and they have mentioned that the sound has decreased significantly as they have worn and washed the clothing. I am assuming these will follow suite as I continue to break them in. Fit: Classic fitting jacket shell. Features: Water-resistant zippered pockets. Interior media pocket with headphone exit port. Removable polar fleece lined hood. 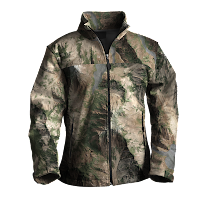 Tech: Water repellent finish, wind resistant fabric, polar fleece lined fabric keeps you comfortable and warm in all climates. Both the jacket and the pants are a shell so they are not a heavy insulated piece of clothing. The thing I do like about that is that it makes it perfect for those mid season hunts. It's warm enough for early in the morning before the sun rises and yet it's not overbearing when it warms up in the day. Once I received the camo, I'll admit that I was skeptical. The colors seemed very light to me and I was worried how it would look in the forest vs a treestand. On the other hand, I was excited because it seemed like it would work out perfect in the sage brush for my antelope season. I did take it out on my elk hunt. There was a lot of sage but there were plenty of pine trees as well. I was able to get within 150 yards of my elk to take a shot and he never spooked. Even after I shot, the cow elk were still milling around at 100 yards or less with me standing in the open. For the sage during my antelope hunt it performed really well. I was able to put some great stalks on antelope, we just won't talk about the shots that were taken. I was very pleased with how it blended in well with the sage brush. It did well in the treestand during my early archery deer season. I felt that the lighter color helped break up my outline with the sky behind me. I did hunt out of some cottonwood trees so they are lighter bark but it worked out really well. Overall I think that this camo works well. I was pleased with how it performed as I pushed through thick brush, crawled through sagebrush with cacti, and kept me concealed and warm during my elk hunt. I have put the this camo through some tough situations and there are not rips or tears. Even after packing out my elk, I didn't have any blood stains after washing. I had the hoodie and the t-shirt as well which were a little darker in color than the jacket and the pants but still had the same camo pattern. The only concern I had with the hoodie was the white laces. I feel like for a hunting scenario it would be a little better with a darker color or even a tan to help match the camo. This isn't a make or break on the camo, as I rarely lace up my hoodie anyways. The price is very affordable and won't break the bank. If you are looking for some new camo at a an affordable price, make sure to give BEX camo a shot. Also follow them on Instagram, Twitter, and Facebook. As with all reviews on High Country Bowhunter, the following review is my honest opinion, I received the BEX Camouflage free of charge and agreed to provide a review in exchange. I am not sponsored by or associated with BEX Camouflage and accepting no other compensation, monetary or otherwise, in exchange for this review. My independent status may change in the future but, as of the date of publication, no relationship other than described above has been pursued or established. There are many different camouflage patterns out there and I am always interested when a new one pops up. Recently I stumbled upon a new up and coming company that grabbed my attention, SatSkin Concealment. They are not your usual camo pattern and that is their intention. I had the opportunity to speak with Jayson from SatSkin Concealment and discuss the story behind the camo pattern. First of all, they are just getting the ball rolling and haven't hit production as of yet. Their main focus was getting the camouflage pattern up to their standards before pushing product out. Jayson said he was looking at all the camouflage that was available and noticed across the board they all had a similar look and pattern. So he helped to assemble a team to help create a 3D camouflage pattern. Yes, a 3D camo! The pattern is based on satellite images of terrain. It is much different than just your typical black, brown, gray, and green. "So, we decided to assemble a team to build a better camouflage. Our team quickly grew to include expert hunters and outdoorsmen, best-in-the-business computer modelers, 3D technical artists, photographers, conservation officers and biologists. SATSKIN™ was created to bring you the best in 3D camouflage patterning, and that remains our sole operating mandate today. Our results speak for themselves: hunters and manufacturers alike are wowed by how our patterns look on the rack and, much more importantly, how they perform in the field." So how does it work? Well, when you are scanning an area looking for an elk or deer, you are looking for that outline of something that is out of the norm. I have scanned mountain sides many times and found some trophy stumps and rocks that looked like deer or elk. The reason being was because they had a distinct solid outline. Jayson mentioned that even with the camo patterns out there today, he feels that they still haven't been able to reach the point of being able to effectively break up the human outline. SATSKIN™ patterns break up a hunter’s solid form into non-identifiable areas of light and dark, allowing the wearer to blend effortlessly with the random light and shadows of the surrounding terrain." They have developed the "industry's first Hyper-Macro™ and Super-Micro™ textures" that result in a Distal BreakUp™ system creating "a 'visual noise' that ensures you stay 'disarticulated' at any engagement distance". Take a look for yourself on some of the camouflage patterns. 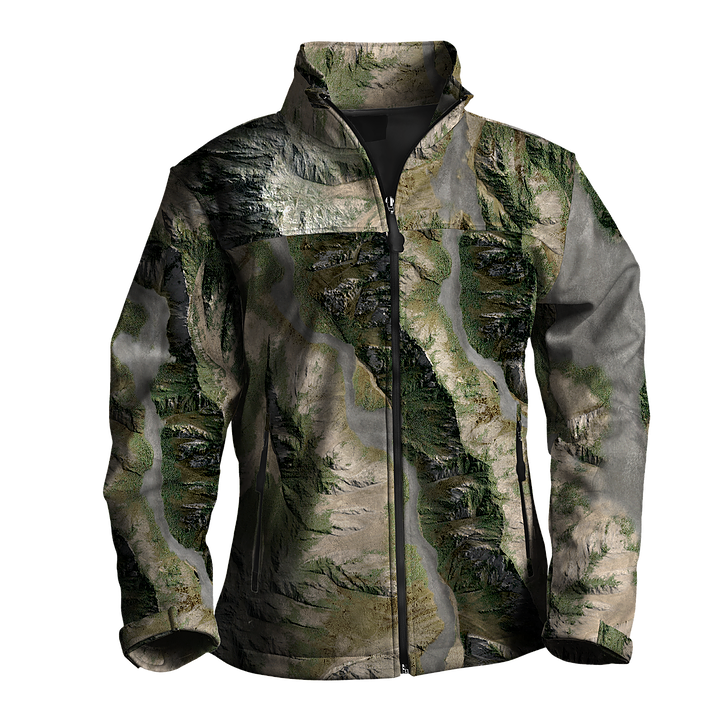 The patterns are definitely unique and they are different from your normal camouflage patterns that are out there and available. SatSkin Concealment will be producing some clothing very soon and I am excited to see what the hunting line up will consist of. I am impressed with the pattern and the technical details that have gone into the production of the pattern and their is much more to come from them besides just camouflage. They are working on what he mentioned to me as an interactive camouflage. It is definitely something to keep on your radar. Keep an eye out on this company as I feel like they will start gaining some real traction soon! Check out their website and follow their social media accounts. Whether it is scouting during the off season or spot and stalk hunting during the season, we all know the importance of taking the time to glass for the game we are hunting. There are plenty of digiscoping adapters out there that you can quickly attach to your smartphone and then to your optics. Recently, Glass It Up sent one of their adapters for me to try out and I have to say, I was very impressed. There are companies that ask for your specific model and make one to fit. It helps ensure that it fits nice and snug without any issues. So when I saw that the Glass It Up adapter uses bands to help make it fit, I'll admit that I was a bit nervous. The idea that I would have to be carrying rubber bands plus the adapter made me leery at first. I did quickly find out that by attaching the rubber bands to the eyepiece on my spotting scope that I was able to use the scope without any limitations. This put my mind at ease and it was simple for me to keep the bands on the eyepiece and keep my phone in my pocket with the adapter. The nice thing is that you can get an inexpensive phone case and attach this adapter to and leave it in your hunting pack. The adapter worked really well and was very simple to use. The nice thing about the Glass It Up is that it is versatile to your optics. I attached the bands to my spotting scope and to my binoculars. It was easy to just swap from my spotter to my binos. Here are some images that I was able to capture. For under $30 you can get one so they are extremely affordable. This is a great way to get into digiscoping and to add one to your pack. As with all reviews on High Country Bowhunter, the following review is my honest opinion, I received the Glass It Up free of charge and agreed to provide a review in exchange. I am not sponsored by or associated with Glass It Up and accepting no other compensation, monetary or otherwise, in exchange for this review. My independent status may change in the future but, as of the date of publication, no relationship other than described above has been pursued or established. A relaxing way to take a nap in the mountains or even at home is with a hammock. I had the chance to review the Top Rope Hammock and I was thrilled to do so. I took this tightly packed hammock with me camping to give it a try. The first thing I noticed was how tightly it was packed. It comes all packed initially I thought to myself that there was no way I would be able to stuff this hammock back in this tiny bag. Upon opening the hammock, I quickly realized that the back was attached to the hammock. This was very convenient because knowing my luck, I would have easily misplaced the bag. The next thing was the straps. I didn't know what to expect for my first hammock review. I had never thought about purchasing a hammock for my camping or hiking adventures. I thought that the straps would have been more complicated for some reason. The straps on the Top Rope Hammock were very simple to adjust and fit it to your need. The hammock itself has carabiners on each end and the straps have loops so you can adjust the length. It made adjustments very easy and simple to use. The material is very light weight which makes it perfect for the warm weather because it will keep you cool. While it is a lighter material, that lead me to question its durability. Luckily I had some help with this portion of the test. I wasn't able to get any pictures of it because we were having too much fun, but I had my nieces and nephews using it as a swing. As you probably guessed, the swing was being jumped into and out of. I thought the material would rip for sure but it held strong. Overall I would definitely recommend Top Rope Hammock. They are worth the money and are perfect for the backpacking trip or even that hunting trip. It was very durable and extremely comfortable. Very easy to set up and take down. Make sure to shoot them an email if you have any questions. They are very new so send Joey an email and let him know I sent you! As with all reviews on High Country Bowhunter, the following review is my honest opinion, I received the Top Rope Hammock free of charge and agreed to provide a review in exchange. I am not sponsored by or associated with Top Rope Hammocks and accepting no other compensation, monetary or otherwise, in exchange for this review. My independent status may change in the future but, as of the date of publication, no relationship other than described above has been pursued or established. Outdoorsman need clothes. Not just clothes but quality clothes. With that in mind I had received the Maximo Shirt from Bushman Outfitters to review. So with the task of putting the shirt to the test, I went on a camping trip to see how it would hold up. Opening up the shirt from the package, the first thing that I was able to notice was the quality of the shirt. You can tell that it is a quality shirt that will last a long time. When you say that phrase, most people think that it also means that it is a heavy duty shirt that is rough. This is not the case. The shirt is made from 100% cotton and is soft yet durable. The shirt has also been enzyme washed which helps give the shirt that soft feel. The nice thing about this shirt is that you can tell Bushman Outfitters thought of the outdoorsman in mind when designing it. It has a water vapor permeability material that allows for breathability so that the sweat doesn't just stick to the shirt. It also is warm enough that as the temperature cooled down there wasn't a huge rush to grab my jacket. Now I'm not saying it dropped below zero and I was perfectly warm but it was a comfortable shirt to wear in both warmer and cooler temperatures. As I was fishing, I was walking through some tall willows and even getting poked by them and pushing through, the Maximo Shirt held up without any issues. There were several times that the shirt would get hung up as I was pushing through the willows and my first thought was that it was going to have a big hole in it. But not once did I ever get a hole or tear. I was overly impressed with the quality of the shirt and the overall comfort. Disclosure of Material Connection: I received the Bushman Outfitters - Bushman T-shirt for free from Bushman Outfitters in consideration for a gear review. As with all reviews on High Country Bowhunter, the following review is my honest opinion, I received the Bushman Outfitters Maximo T-Shirt free of charge and agreed to provide a review in exchange. I am not sponsored by or associated with Bushman Outfitters and accepting no other compensation, monetary or otherwise, in exchange for this review. My independent status may change in the future but, as of the date of publication, no relationship other than described above has been pursued or established.